Kodak has announced the launch of its new Z-Series digital camera – KODAK EASYSHARE Z950, which combines 12 megapixel sensor, image stabilized SCHNEIDER-KREUZNACH VARIOGON 10x optical zoom (35–350 mm) lens and Smart Capture technology into a single device, capturing challenging action shots without delay thanks to the less than 0.3 second click-to-capture speed. “The combination of these features plus a 12 MP sensor makes the Z950 a compact digital capture powerhouse, with outstanding image quality and ease of use at an affordable price,” said John Blake, General Manager Digital Capture and Devices, Vice President, Eastman Kodak Company. 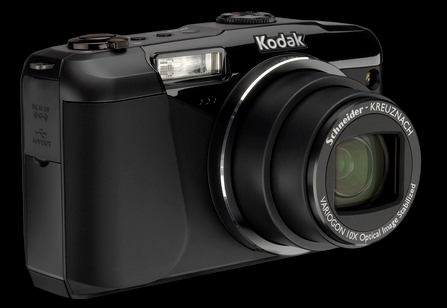 The new KODAK EASYSHARE Z950 digital camera which measures 110 × 66.8 × 35.5 mm and weights 223 g is expected to hit the market beginning August 2009 for around $280.